Earlier in the year we were invited by ENISA (the European Network and Information Security Agency) - an agency of the European Union - to take part in their 2009 spam survey, where they were surveying ISPs and other companies across the continent about spam, what is done to stop it and the effect it has on customers and providers alike. We were happy to do so, given the measures we have already deployed across our various platforms to counter spam. The measures vary at this point in time as we're in a transitional period, with some customers on the Google platform (those with @virginmedia.com and @virgin.net e-mail addresses), some on the Openwave platform (@ntlworld.com) and some on the Exim/Microsoft platform (@blueyonder.co.uk) but all are unifying onto the same technology as we move our e-mail provision to Google, which completes next year. We've spent quite a lot on the measures in place on our own network, and do drop a heck of a lot of e-mail as spam and viruses - well over 9 out of 10 e-mails usually don't get into customer inboxes as they are not genuine mails. 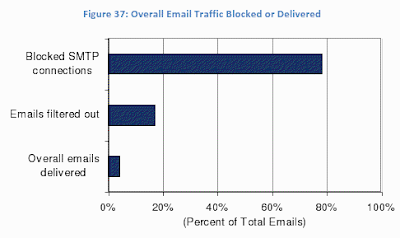 This is very much a pattern common across the continent going by the survey results: The survey reports only 5% of e-mail gets as far as user inboxes, showing both how effective anti spam measures there are and just how much spam there is. Imagine if your mailbox has 20 times the mails already in it if anti spam measures were turned off! The results of the study can be found here if anyone fancies a read.